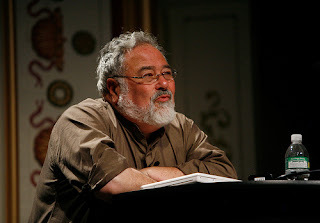 Pictured is George Lakoff, who is Richard and Rhoda Goldman Distinguished Professor of Cognitive Science and Linguistics at the University of California at Berkeley, where he has taught since 1972. Lakoff has both an "academic" and a "political" biography, and is sometimes called a "lefty." Most recently, he has become known for applying the concepts of "framing" to political discourse, in an effort to advance a "progressive" political agenda in the United States. If you want to see what that is all about, you should probably read Lakoff's book, Don't Think Of An Elephant. "Framing" (according to Wikipedia) "refers to a set of concepts and theoretical perspectives on how individuals, groups, and societies organize, perceive, and communicate about reality. Framing is commonly used in media studies, sociology, psychology, and political science." In its largest compass, "framing" is what establishes a "world view," an understanding of the nature of reality. The political and social implications of framing are clear. Depending on what view we have of the world, we either take, or don't take, certain actions. In fact, we pretty much cannot take actions that are at odds with our view of reality, since we literally cannot "picture" what such an action would be; such an action would be "unthinkable," and thus undoable. Since our human reality is most immediately created by human actions, the nature of our "world view" makes a huge difference. How we "frame" things will (almost automatically) determine what happens. Lakoff applies the general concept in the contemporary political arena. I was a history student when I was in college, and there are different types of history. There is "political history," the description of who controlled political power over time; there is "economic history," and "social history." There is also "intellectual history," in which we investigate the changing "ideas" that have shaped and "framed" our human thinking, and that have thus delimited and determined the reality we inhabit. I have come to have a "Two Worlds" frame in which to picture reality, based on my personal experience as an elected official in Santa Cruz County, California. Within the "human" world that is susceptible to change by human action, I think anything is possible. But understanding that this human world is ultimately dependent on another world, the World of Nature, a world that we did not create, and which preexists us, permits me to understand that if "anything is possible" in our human world, some of those possible things are not "advisable," however "possible" they might be. Thus, while we can cut down the rainforests, the consequence is quite likely to be the end of human civilization. If all we see is the "human world," we may not appreciate enough this concept that "Nature bats last."